Located about 150 kilometers northeast of the capital Colombo, Dambulla is a Buddhist pilgrim town. Trouble erupted when a mob of around 2,000 Sinhalese, including monks led by the mahanayaka (chief priest) of the Rangiri Dambula chapter, Inamaluwe Sumangala Thero, stormed the mosque and damaged it, disrupting ongoing Friday prayers. Television footage has captured the mob chanting derogatory and racist slogans. Monks can be seen going on a rampage, with one monk even disrobing and exposing himself. Although Buddhism advocates peace and tolerance, the way it is practiced by a fringe – albeit one that is growing and extremely powerful – is rather violent, fanatical and far from accommodative. The end of the civil war and the defeat of the Liberation Tigers of Tamil Eelam in 2009 triggered a tidal wave of Sinhalese-Buddhist triumphalism. It has manifested itself in a new cockiness vis-a-vis the international community. In the war-ravaged, Tamil-dominated Northern province this muscular assertion of the Sinhala Buddhist identity has manifested itself not only in increasing Sinhalization of signboards and village and street names but in a proliferation of Buddha statues and Buddhist temples. 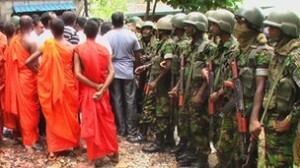 If recent events in neighboring India are anything to go by, the attack on the Dambulla mosque is reason for concern. 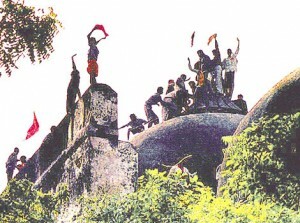 Twenty years ago, Hindu mobs led by the Sangh Parivar, a family of Hindu right wing organizations, and egged on by saffron-clad clergy, stormed a 16th century mosque, the Babri masjid, in the north Indian city of Ayodhya. They alleged that the masjid was built on the site where the Hindu deity Ram was born and where a temple once stood. The mob demolished the mosque even as the administration and police looked on, while the rest of India watched with horror the live telecast of the event. The demolition of the Babri masjid set off a series of events – communal riots, terrorist attacks and pogroms – whose impact continue to traumatize India 20 years later. The law of the jungle prevails. We have yet to hear any responsible statement from the Govt or its leaders. Buddhist(blessed by mahanayakes)and also bottom of the ordinary sinhalese think almost Buddha as “Srilankan born Sinhalese”. threaten other entities. 99% of the recent ‘statue of buddha’ illegally established in North-East by only military or with government help. 1. Sinhalese are Genaticaly Dravidian Race. I am confused about meaning of the term “Sacred Area /Zone” that is being bandied around both by SOME of the Buddhist Clergies and some ultranationalist politicians and organization. Is there a definition of the so called “Sacred Zone”? If so could someone enlighten me on this? Is removing the places of worship of other faith alone would make it a Sacred Zone? Does it mean that places of worship of other faiths are pollutants of the Buddhism and thus make the so called zone un-scared? What about the other explicitly prohibited issues like Wine Stores, Taverns, Brothels, Gambling joints, Drug dealings? Can they operate freely and with the patronage of the Buddhists without hindrance? I hope some proponents of these Zones would enlighten us! One begins to wonder whether there is a new definition evolving out of these apparently meaningless acts of vandalism. Declaring an area as the Scared Zone and removing other places of worship is justified on a piecemeal basis, it would give way in the long run to a precedent and open license one day to declare whole Sri Lanka as the sacred country and get rid of all the other religions? The fault for lawlessness and anarchy is due to the mentality of the “rulers” who adopt a policy of “rocking the cradle and pinching the baby” They have their “private army” which is under their payroll to lead the mob!! Their silence speaks the truth!! What constitute a Dravidian race? If a particular DNA structure is attributable to Dravidians what do you call that unique marker? I am most grateful if you can give us similar marker for Aryan. When did Sri Lanka become home for Sinhalese and Native Tamil(Hindus,Christians,Muslims)? I don’t think it is wise to call these Kallathonies as natives and I vehemently object to it. I rather prefer you call them Kallathony Tamil speaking people or Kallathony Sinhala speaking people. I knew that the Sinhalese as well as the Tamils have identity crisis. However this is not the time or place to discuss the origin of both stupid people. Sudha Ramachandran’s comparison of Sinhalese Buddhism with Hindutva is shoddy. Perhaps the title of the article is not hers but it sure is deceptive. The rest of the article is spot on. Indians should stop comparing Sri Lanka with events in India and see the situation in Sri Lanka in its own right and history. Buddhism in Sri Lanka has been radical for a lot longer period of time, targeting Christians and Muslims since the 1800s as Tambiah well documents in his ‘Buddhism Betrayed’. Churches have been petrol bombed. Buddha statues arbitrarily placed within the premises of old Hindu places of worship – like Tirukethisvaram and Tirukonesvaram that are pivotal landmarks of Sri Lankan Tamil history. If any one is thinkding this is an unbias and balance article which written by a schelor, he/she should get a physeological check up. Come on Mr President, this is your chance to show us and the world that your are truly the leader of all sri Lankans,as you have stated repeatedly, and not just of one community.